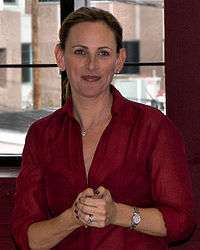 Children of a Lesser God, Switched at Birth and "The West Wing"
Marlee Beth Matlin (born August 24, 1965) is an American actress. She won the Academy Award for Best Actress in a Leading Role for Children of a Lesser God (1986), and is the only deaf performer to win the award. Her work in film and television has resulted in a Golden Globe award, with two additional nominations, and four Emmy nominations. Deaf since she was 18 months old, due to illness and high fevers she is also a prominent member of the National Association of the Deaf. Her longtime interpreter is Jack Jason. Matlin was born in Morton Grove, Illinois, to Libby (née Hammer) and Donald Matlin (1930–2013), an automobile dealer. She has two older brothers, Eric and Marc. She lost all hearing in her right ear and 80% of the hearing in her left ear at the age of 18 months. In her autobiography I'll Scream Later, she suggests that her hearing loss may have been due to a genetically malformed cochlea. She also stated she is the only member of her family who is deaf. She grew up in a Reform Jewish household; her family is from Poland and Russia. Matlin attended a synagogue for the deaf (Congregation Bene Shalom), and after studying Hebrew phonetically, was able to learn her Torah portion for her Bat Mitzvah. She was later interviewed for the book Mazel Tov: Celebrities' Bar and Bat Mitzvah Memories. Matlin graduated from John Hersey High School in Arlington Heights and attended Harper College. In her autobiography I'll Scream Later, she described two instances when she was molested by her babysitter at age 11 and by her teacher in high school. Matlin made her stage debut at the age of seven, as Dorothy in an International Center on Deafness and the Arts (ICODA) children's theatre of The Wizard of Oz, and continued to appear with the ICODA children's theatre group throughout her childhood. Her discovery by Henry Winkler during one of her ICODA theater performances ultimately led to her film debut in Children of a Lesser God (1986). That film brought her a Golden Globe Award for Best Actress in a Drama and an Academy Award for Best Actress. Two years later, she made a guest appearance on Sesame Street with Billy Joel performing a revised version of "Just the Way You Are" with lyrics by Tony Geiss. Matlin used sign language during the song and hugged Oscar the Grouch during the song's conclusion. One year after that, Billy Joel invited her to perform in his video for "We Didn't Start the Fire" where she played the prom-queen-turned-hippie in the mid portion of that video. In 1989, Matlin acted out the role of a deaf widow in Bridge to Silence; in it, she actually spoke in addition to using sign language. Matlin was nominated for a Golden Globe award for her work as the lead female role in the television series Reasonable Doubts (1991–1993) and was nominated for an Emmy Award for a guest appearance in Picket Fences; Matlin, indeed, became a regular on the series during its final season. She impersonated Carrie Buck in the 1994 television drama Against Her Will: The Carrie Buck Story, based on the United States Supreme Court case Buck v. Bell 274 U.S. 200, which the Court heard in 1927. In the movie, Matlin, by impersonating Buck, acted out the role of a hearing woman for the first time in her career, and indeed, she earned a CableACE Nomination as Best Actress for doing so. Matlin later had recurring roles in The West Wing, and Blue's Clues. Other television appearances include Seinfeld ("The Lip Reader"), The Outer Limits ("The Message"), ER, The Practice and Law & Order: Special Victims Unit. She was nominated for Primetime Emmy Awards for her guest appearances in Seinfeld, Law & Order: Special Victims Unit and The Practice. In 2002, Matlin published her first novel, titled Deaf Child Crossing, which was loosely based on her own childhood. She later wrote and published a sequel titled Nobody's Perfect, which was produced on stage at the John F. Kennedy Center for Performing Arts in partnership with VSA Arts in October 2007. In 2004, she starred in the movie What the Bleep Do We Know!? as Amanda. She also hosted the 3rd annual Festival for Cinema of the Deaf in Chicago, from October 15 to October 18, likewise in 2004. In 2006, she played a deaf parent in Desperate Housewives. She also had a recurring role as Joy Turner's (who made many jokes of Matlin's deafness at her expense) public defender in My Name Is Earl and played the mother of one of the victims in an episode of CSI: NY. That same year, Matlin was cast in season 4 of The L Word as Jodi Lerner, a gay sculptor. She appeared in season 4 (2007), season 5 (2008) and season 6 (2009) as the girlfriend of one of the show's protagonists, Bette Porter, played by Jennifer Beals. On February 4, 2007 and February 7, 2016, Matlin interpreted the "Star Spangled Banner" in American Sign Language at Super Bowl XLI in Miami, Florida and at Super Bowl 50 in Santa Clara, California, respectively. In January 2008, she appeared on Nip/Tuck as a television executive. On February 18, 2008, it was announced that Matlin would participate as a competitor in the sixth season of ABC's Dancing with the Stars. Her dance partner was newcomer Fabian Sanchez. But Matlin and Sanchez were the sixth couple eliminated from the competition. On November 8, 2009, Matlin appeared on Seth & Alex's Almost Live Comedy Show, hosted by Seth MacFarlane and Alex Borstein. After Borstein imitated Matlin calling MovieFone and singing "Poker Face," Matlin herself appeared and launched into a comical tirade against Borstein over being made fun of, and how she was not invited to provide her own voice for Family Guy. Matlin went on to voice Stella, Peter's coworker, in the Season 10 episode "The Blind Side;" Stella later became a recurring character. In 2010, Matlin produced a pilot for a reality show she titled My Deaf Family, which she presented to various national network executives. Although they expressed interest, no network purchased rights to the show for ongoing production. On March 29, 2010, Matlin uploaded the pilot to YouTube and launched a viral marketing campaign. In the following year, Matlin was a finalist on the NBC show The Celebrity Apprentice, competing to win money for her charity, The Starkey Hearing Foundation, finishing in second place. However, on one episode of The Celebrity Apprentice, "The Art of the Deal," which was transmitted on April 3, 2011, Matlin raised more funds than had ever been raised for charity in a single event on any television show before--USD$986,000. Donald Trump, who was then moderating The Celebrity Apprentice, then donated an additional USD$14,000 to make the contribution an even million. As of January 2015, Matlin also acted as the American Civil Liberties Union's celebrity ambassador for disability rights. Most recently, Matlin was acting out the recurring character Melody Bledsoe on the ABC Family television teen/family drama series Switched at Birth. In September 2015, Matlin made her Broadway debut in the revival production of the musical Spring Awakening. On April 14, 2009, Matlin released an autobiography, I'll Scream Later. In it she describes her drug abuse and how it drove her to check herself into Betty Ford. She also tells about her rocky, two-year relationship with actor William Hurt, who she claims was physically abusive to her and she abused drugs during that time. She also addresses the sexual abuse she says she suffered as a child at the hands of her female babysitter. ↑ "Marlee Matlin: ‘Do What You Have To Do’", NPR, August 11, 2010. ↑ Rick Rojas, "Jack Jason gives voice to, but doesn't talk over, Marlee Matlin", Los Angeles Times, May 21, 2011. ↑ Marlee Matlin. Film Reference.com. 1 2 "Marlee Beth Matlin roots". Rootsweb.com. Retrieved June 16, 2012. ↑ "Inside Actress Marlee Matlin's Silent World". Good Morning America. ABC. April 14, 2009. p. 4. Retrieved June 16, 2012. ↑ Matlin, I'll Scream Later (2009), pp. 21–22. ↑ "Mazel Tov: Celebrities' Bar and Bat Mitzvah Memories". Review at Amazon. ↑ Heidemann, Jason A. "Vital signs". Time Out Chicago, October 4, 2007. ↑ Matlin, Marlee (2010). I'll Scream Later (First ed.). London. pp. 56–61. ISBN 978-1439171516. ↑ "A gateway to arts for the deaf". 4hearingloss.com. August 18, 2006. Archived from the original on September 2, 2006. Retrieved November 9, 2015. ↑ Stark, John (October 20, 1986). "Deaf Actress Marlee Matlin Broke the Sound Barrier with New Love and Lesser God Co-Star Bill Hurt". People. Retrieved December 18, 2011. ↑ "Why Marlee Matlin and Henry Winkler are captivating audiences". Greater Talent. Retrieved 2015-12-12. ↑ "Marlee Matlin Signs Off from Dancing". People. April 23, 2008. Retrieved December 18, 2011. ↑ "Marlee Matlin receives Walk of Fame star", The Los Angeles Independent, May 6, 2009. ↑ "Marlee Matlin Launches ''My Deaf Family'' on YouTube". Insidetv.aol.com. March 31, 2010. Retrieved October 29, 2011. ↑ "ACLU Ambassadors - Marlee Matlin". aclu.olrg (American Civil Liberties Union). Retrieved 2015-01-05. ↑ Gioia, Michael; Viagas, Robert (July 21, 2015). "Children of a Lesser God Oscar Winner Marlee Matlin Will Make Broadway Debut in Spring Awakening". Playbill. Retrieved November 8, 2015. ↑ "Marlee Matlin, The Gift of Silence: A Conversation with Marlee Matlin". Voices Inc.com. April 4, 2007. Archived from the original on 2007-06-02. ↑ "Marlee Matlin Biography". The Kennedy Center. Retrieved 2015-12-12. ↑ "Film and Television Celebrities Promote Jewish Federations in First-Ever National Television Advertising Campaign - Jewish Stars Promote Federations' Initiatives and Mission", Jewish Federations of North America, August 2, 2004. ↑ "''Transcript of honorary degree ceremony at Gallaudet''" (PDF). Retrieved October 29, 2011. ↑ "''Photo in 1987 Gallaudet Tower Clock yearbook''" (PDF). Retrieved October 29, 2011. 1 2 Profile: Marlee Matlin. Gallaudet University. Access date: December 26, 2007. ↑ "Past Winners — Greatest Public Service by an Individual 35 Years or Under". jeffersonawards.org. Archived from the original on November 24, 2010. Retrieved November 9, 2015. ↑ Rubin, James H. (June 21, 1988). "Koop, Marlee Matlin Win Awards for Public Service". Associated Press. Retrieved November 9, 2015. 1 2 Marlee Matlin, Betsy Sharkey (2009). I'll Scream Later. Simon and Schuster. ISBN 1-4391-7151-3. ↑ William Hurt (April 14, 2009). "William Hurt to Marlee Matlin: "I Apologize for Any Pain I Caused"". Eonline.com. Retrieved October 29, 2011. ↑ "Marlee Matlin: Baby sitter's abuse led to life of drugs, violence". CNN. April 14, 2009. ↑ Sterman, Paul. "Ability Magazine: Marlee Matlin Story". Retrieved November 9, 2015. ↑ "Weddings of the Year". People. 42 (4). July 25, 1994. ↑ Lipton, Michael A. (March 15, 1993). "Law and Ardor". People. Retrieved December 18, 2011. ↑ Rizzo, Monica (March 28, 2008). "At Home with Marlee Matlin". People. Retrieved December 18, 2011.